However, employers should understand that there are times when a background credit check is an appropriate, job-related action that will contribute to better hiring decisions. Furthermore, performing these checks is perfectly legitimate if they are done in an appropriate way. The benefits for employers are straightforward. Credit history is an excellent window on the habitual responsibility of applicants, and on their vulnerability to occupational fraud or theft. It is especially important if the applicant is seeking a position that provides access to significant controls or financial assets (including cash). Broadly speaking, the Equal Employment Opportunity Commission (EEOC) guideline that background checks should be performed only if they are job-related and a business necessity holds true. Each job role should be assessed to determine if the credit check can meet this standard, and if the state law does not prohibit it. Avoid applying a blanket rule under which pronouncing any applicant would be rejected for a specific negative credit history (treat applicants as individuals). Once you determine that a credit check is an appropriate tool in your hiring process, follow the rules set out in the Fair Credit Reporting Act (FCRA). Give the applicant written notice that you will perform a credit check and use it in making the hiring decision. Get the applicant’s written permission. If the credit check leads to an adverse action, tell the applicant that you may reject them and why. Allow the applicant access to the credit report and give them time to rebut it (credit reports do sometimes include inaccurate information). If you follow the steps in the FCRA, taking adverse action should be justifiable and avoid discrimination. 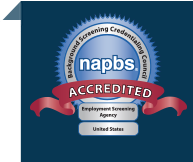 If you are in doubt, a qualified background screening company can help you stay on the right side of the law, and get the most useful background information available.